In April 2014, booksellers George Koppelman and Daniel Wechsler announced their belief that they had discovered William Shakespeare’s own personally annotated dictionary. The dictionary, John Baret’s An Alvearie: Or, Quadruple Dictionarie, containing “Foure sundrie tongues: Namelie, English, Latine, Greeke and French,” was printed in London in 1580 and is now on loan at The Folger Shakespeare Library. 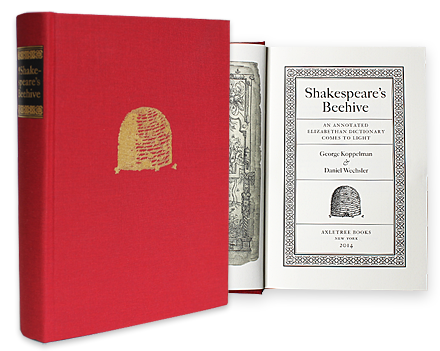 Their book, Shakespeare’s Beehive: An Annotated Elizabethan Dictionary Comes to Light, reveals how the annotator carefully worked his way through the Alvearie, leaving, in turn, astonishing linguistic allusions to the whole of Shakespeare’s canon and also, importantly, many “fingerprints” that match frequently debated biographical speculations. Koppelman and Wechsler have independently both spent more than two decades working with rare books. Each is a member of the Antiquarian Booksellers’ Association of America, the International League of Antiquarian Booksellers and the Grolier Club. Since first meeting at Wechsler’s Upper West Side shop, Book Ark, in 1995, they have shared a common bond over a love for, and a devotion to, the labyrinthine world encompassed by books. 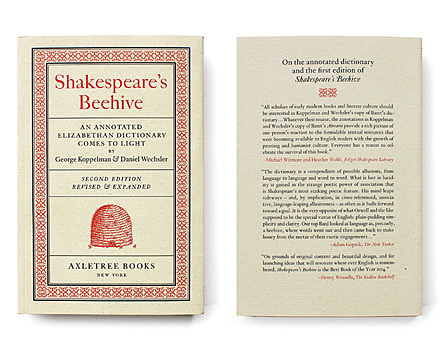 In 2014, they published jointly their co-authored book, Shakespeare’s Beehive: An Annotated Elizabethan Dictionary Comes to Light, under the imprint of Axletree Press, after six years of largely independent research and study. A revised and expanded second edition of the book was released 18 months later.